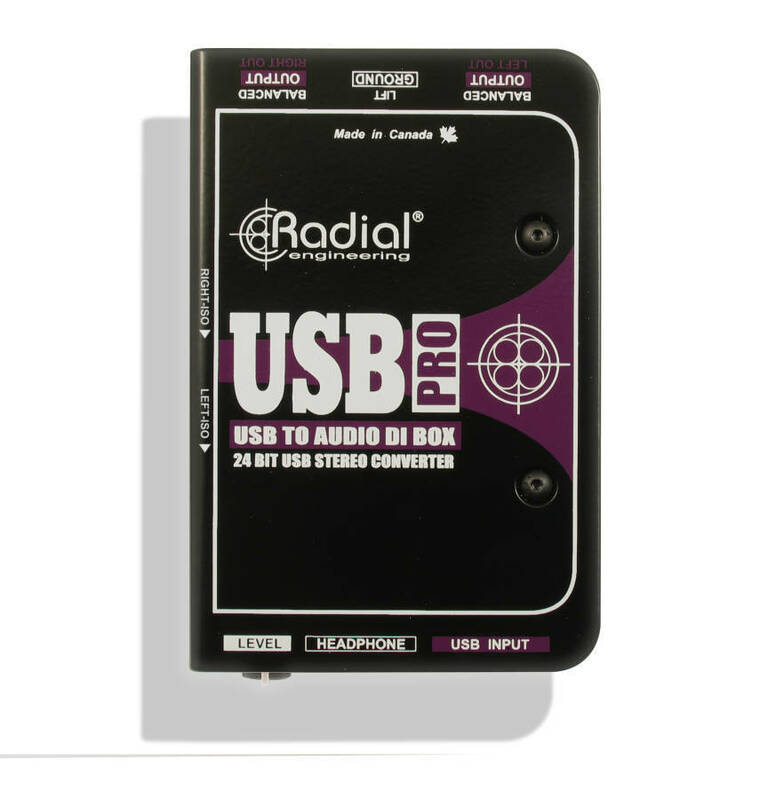 The Radial USB-Pro is a high-resolution stereo direct box designed to convert sound files from a laptop computer and seamlessly transfer them to a pair of balanced audio outputs to feed a PA, recording or broadcast mixing console. Made to be plug & play easy to use, the USB-Pro automatically configures itself for use with all popular operating systems including Mac OSX, Windows XP, Vista and Windows 7, thus eliminating the need to load special drivers. Unlike devices that are limited with 16 bit, 44.1kHz conversion rates, the USB-Pro elevates the performance with true 24 bit, 96kHz stereo converters to deliver more headroom and greater detail. This eliminates the need for additional sound cards or separate converters when transferring files, further streamlining production in busy work environments. Connection from the laptop is done via the 'pro-audio standard ' USB type-B port. Digital-to-analog conversion is monitored with the built-in headphone amplifier to ensure the signal is being properly downloaded and converted. A mono-sum switch may be engaged to check for phasing or facilitate signal distribution to two outputs should this be preferred. One simply sets the output volume control to suit. Should hum or buzz caused by ground loops be encountered, two 'set & forget' side-access switches let you insert isolation transformers into the signal path to block stray DC voltage offsets. To further reduce susceptibility to noise, this is augmented with a ground lift switch that lifts pin-1 on the two XLRs. 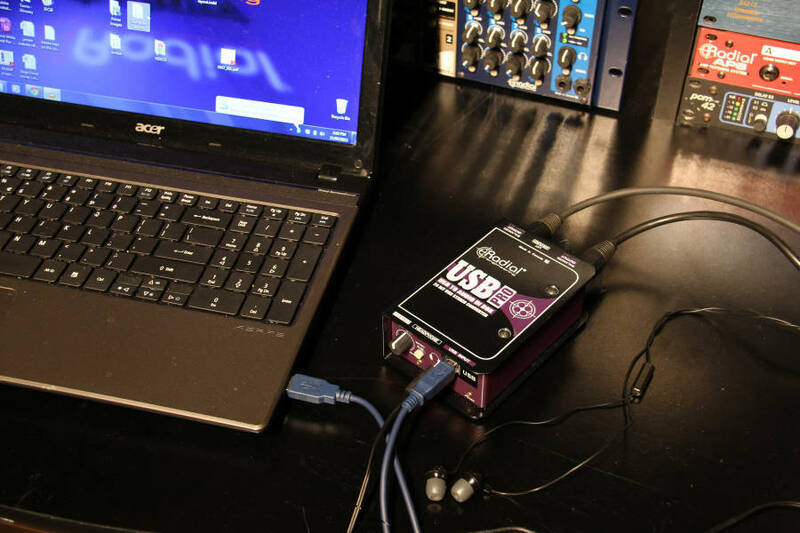 As with all Radial products, the USB-Pro is designed to handle the rigors of professional touring. Our unique book-end design creates protective zones around the switches, connectors and controls to keep them out of harm's way. Inside, our time-tested I-beam construction assures the sensitive internal PC board will not torque which could otherwise cause premature part failure. Finally, a full bottom no-slip pad provides mechanical isolation and electrical insulation, further advantaging the user. Awesome product! I am a mobile DJ. I have been using a different brand high end USB interface for three years, but sometimes my laptop would not recognize it at gigs. This was not acceptable when I did not have time to trouble shoot. I wound up going out of the earphone jack into the mixer. Terrible sound quality! 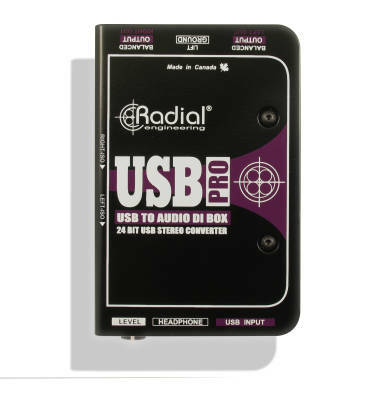 My Long and McQuade salesperson recommended the Radial USB-Pro and I bought one. It worked right out of the box! My laptop recognized it and it sounds great! I have had the opportunity to use this unit at a few gigs now and I love it! There are no special drivers to install on your computer. Just plug and play! A great little DI box for connecting a laptop running Mainstage or similar software for a keyboard to the mixer for live sound (usb/midi keyboard -> laptop -> Radial USB -> mixer via XLR). Good features to support smaller, less capable mixers such as a mono switch and isolation switches for boards that blindly send phantom power to every channel. A little more than I wanted to pay but it's solid. Much better than connecting with the crackly 1/8th inch headphone jack.